A homeless person walking through the streets of Dublin. LAST MONTH, THE government announced its intention to expand its Housing First plan, which aims to reduce and end rough sleeping and long-term homelessness, from Dublin and across the country. In the past, homelessness services in Ireland and much of Europe and the US were geared towards a staircase model of recovery. The approach was pioneered in 1992 in New York by Dr Sam Tsemberis. In Ireland, a shift away from the staircase model and towards Housing First was signalled in the 2011 Programme for Government. While this programme has been up and running in Ireland for a number of years, the widespread implementation of it is a work in progress. Ireland isn’t the only country in Europe which has had a major crisis when it comes to homelessness. Many others have too. But unlike its neighbours, one, in particular, has succeeded in significantly lowering its homeless rate by using the Housing First model. In the 1980s, close to 20,000 people were homeless in Finland. Today that number is closer to 6,600. So, as the new Housing First implementation plan was published in Ireland last month, let’s take a look at how Finland succeeded in its use of the programme. Finland cut the number of homeless people in the country in half between 1987 and 1996. But by 2003, however, the decline in the homelessness population had slowed down significantly, with the number hovering around the 8,000 mark. The consensus was that the homeless who had been easier to house had been housed, leaving behind the long-term homeless. This cohort of people made up about 40% of the homeless population in 2008. Typically they would have had a myriad of social and health problems, requiring a lot of care. It has been the centre of the Finnish government’s policy towards ending homelessness since 2008. And it’s working, as is evident from the figures above. What has made the Finnish approach Housing First so striking was the removal of almost every shelter and emergency accommodation unit. They were turned into supported housing units with independent flats for the tenants. On-site personnel are available at the properties. “The idea was to provide housing for long-term homeless people. That meant we had to do something to the existing shelters and hostels,” Juha Kaakinen, CEO of the Y-Foundation, the organisation which has spearheaded the housing first programme in Finland, said. In many cases, [emergency accommodation] isn’t the solution for homelessness for many rough sleepers, it’s also an obstacle. It’s not something that they want. There are people who prefer to sleep rough if the only solution is living in temporary accommodation. Kaakinen was speaking during a discussion on tackling homelessness in Finland and Ireland yesterday. He noted one specific example in Helsinki. Alppikatu 25 opened as a 250-bed shelter in 1936. Since 2012, it has been converted into supported housing units. Now, 81 independent rental apartments house 88 residents. On-site personnel is provided by the Salvation Army. Only one hostel with 52 temporary beds remains open in Helsinki. Since Housing First was launched in Finland, rough sleeping has essentially ceased to exist. It is worth noting at this point that government support and financing has been integral to the programme’s success in Finland. The movement from hostels to homes was achieved through an ambitious, state-sponsored programme of renovating emergency shelters, building new houses and acquiring other homes through the private rental sector. So, can the Housing First programme actually work in Ireland? Dublin Housing First has been operating since 2014, overseen by workers from the Focus Ireland and the Peter McVerry Trust, following a successful pilot. More on how Housing First was first set up in Dublin can be read here. Under Rebuilding Ireland, the government pledged to triple the targets for tenancies to be provided by Housing First teams in Dublin, from 100 tenancies to 300 by the end of last year. Speaking to TheJounal.ie at yesterday’s discussion, National Director of Housing First Bob Jordan said that the goal “wasn’t quite achieved”. So far, 214 individuals have been helped through the programme. Nevertheless, last month saw the launch of the Housing First National Implementation Plan 2018-2021. 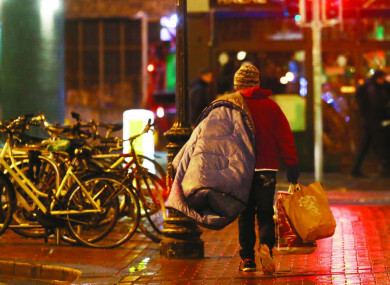 The plan was widely welcomed by housing and homeless charities across the country. While it has shown strong successes in providing homes for long-term rough sleepers, the programme can only meet its full potential if adequate housing units are built. “What we’re trying to do is identify a stock of Housing First units because it’s really the units that dictate the pace,” Jordan said. So, what does this new government plan aim to achieve? Provide a total of 663 permanent, secure tenancies across 31 local authorities for people with a history of rough sleeping or long-term use of emergency accommodation with complex needs. Provide the vast majority of Housing First tenants with permanent social housing, allocated by local authorities. Ensure that complex needs around mental health, alcohol and drug addiction will be addressed with up to daily support visits delivered by housing and health support teams. Latest figures from the Department of Housing show that there were 5,869 adults and 3,829 children in emergency accommodation in Ireland during the recorded period in September – a total of 9,698 people. With those figures in mind, TheJournal.ie asked Jordon is Housing First in Ireland will make a significant change to the level of homelessness the country is currently experiencing. “While we’re dealing with a narrow group of people here, the guts of 750 people to begin with, they are people with quite deep issues around addiction and mental health,” he said. If we can resolve it for the hardest person, then it’s pretty clear that we can create a system that works for everybody. When asked if he thinks the programme can become a success in Ireland, Kaakinen added: “I really hope that it will really change things because I was here over a year ago and I think that the situation is even worse than it was at that time. “So, I really would like to see this plan and programme to be put into practice and become a reality. Papers don’t end homelessness, it’s action that’s needed. Email “The government is trying to reduce chronic homelessness ... Here's how Finland ended it ”. Feedback on “The government is trying to reduce chronic homelessness ... Here's how Finland ended it ”.